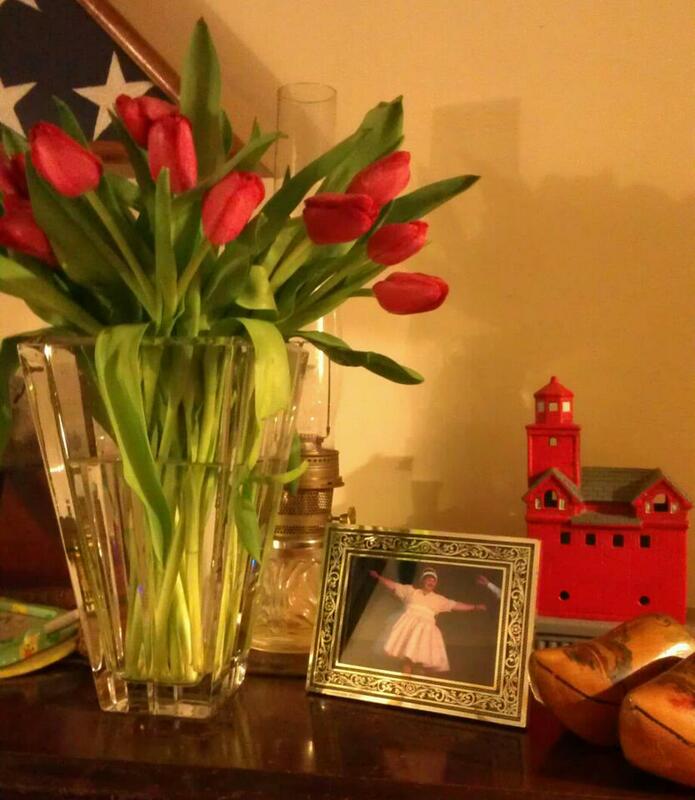 It all started with this tulip bouquet picture that Lynne V. shared with her Lifeboat group on Valentines Day, saying, "Here's the red tulips that Joe would have bought me. Something told me to get them this year anyway. Yeah, that's him in the picture." And then she waited while curious minds of special church ladies looked at the picture in various phases of shock: was that man wearing a dress? Finally someone mustered up enough chutzpah to ask, which was the opening Lynne was waiting for all along so she could show us her "Angel Joe" and share his glorious theatrics and fun! "When our baby Thomas was a just a few months old, we went to Walt Disney World with some friends. One of their traditions was to go to the Hoop de Doo Review at Fort Wilderness Campground. This is a frontier dinner show experience where the players choose members of the audience to participate in the show. Well, Joe had very outgoing personality, and a uniqueness that he wore on his sleeve. So they, of course, chose him to come up and be in the show. They all got their parts and stage directions backstage and Joe stood around wondering when he’d get his role. Having had some prior experience in the theater world, he knew what this meant….and it worried him. Okay, he really secretly (or not so secretly) loved it. He was chosen to BE the finale….the comic relief! 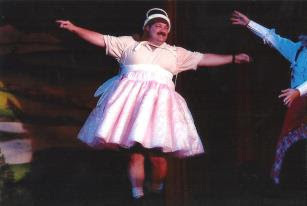 So we all waited in the audience, not knowing what was coming….and out comes Joe, all 230 pounds of him as Davy Crockett’s angel! Complete with his cheesy mustache, one-size-fits-most pink tu-tu, wings and halo….and his massive hiking boots which he wore everywhere. And he hams it up to the point of skipping to center stage, doing a perfect pirouette, and blowing kisses to the audience! We laughed SO hard that we cried. He LOVED being the center of attention, and he told this story over and over again. He is smiling from above knowing that I now share it with you ladies. March 10 would have been Joe's birthday, so this is a great day to share this with you all. Lynne also said, "It is so healing to be able to get past the dark and dismal memories of the last days with our beloveds. I found that when I was able to look back and smile, I felt like I was finally heading in the right direction. Having a forum to share all those blessed memories accelerates the healing! I'm sure that Joe is doing a heavenly tap dance in celebration of his new found fame!" When you are ready, begin to rebuild your life on the gifts of happiness, fun, and humor that your husband built into you. If you have some fun pictures and stories you'd like to share here with your friends at WCP, please email me at WCplace@gmail.com. Thanks everyone, and thank you, Lynne and Angel Joe! What a wonderful, happy post. It has me smiling. Love and hugs to you Lynne and thank you for sharing your story. Thank you for sharing this with us Lynne! 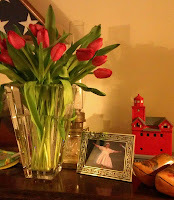 I love the picture with the Tulips along side the picture of your husband. What a wonderful way to present the perfect picture of him. Even from up above..he is still making you smile.